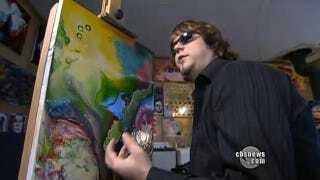 Last night the CBS Evening News told the incredible story of John Bramblitt, an artist who learned to paint after going blind at 30. Bramblitt uses his fingers to guide the brush strokes and has taught himself to mix colors by feeling the texture in the paints. He's painted unbelievably accurate portraits of his wife and son, who he's never seen, and his work is starting to draw attention from the art world.